Scope refers to where variables and functions are accessible, and in what context the code is being executed. You can think of a house with rooms. The house is inside the global scope. Each function and block creates a new room nested inside the house. The variables declared inside those rooms remain visible/accessible only when you are inside that room. Once outside the room, those variables are no longer accessible. is the current context of execution. is the context in which values and expressions are “visible,” or can be referenced. If a variable or other expression is not “in the current scope,” then it is unavailable for use. Scopes can also be layered in a hierarchy, so that child scopes have access to parent scopes, but not vice versa. We have several scopes available to us. Global, function, block, and eval (more on eval in a moment). Global scope is the default. Everyone and everything has access to the global scope. Functions and variables in the global scope are “vulnerable” because they can be accessed by everything and potentially mutated. Variables declared in the function (using var, let, or const) can only be accessed by the other code inside the function. You control what you create. Variables declared in the block statement (if blocks, for loops, etc) using let or const can only be accessed by other code inside the block. Variables declared in block statements using var will be hoisted out of the block and to the top of the enclosing parent scope (the function or the global scope containing the block statement). Eval can be very dangerous! It executes the code passed into it with the privileges of the caller. If you run eval() with a string that could be affected by a malicious party, you may end up running malicious code on the user’s machine with the permissions of your webpage / extension. More importantly, third party code can see the scope in which eval() was invoked, which can lead to possible attacks in ways to which a similar function (with the usual protections of function scope) is not susceptible. Even though buildLaser and buildMoonBase both use a variable called message, because they are declared within a function, those variables do not interact or overwrite each other; they both occupy a separate piece of memory. Both variables are scoped to their own function and can only be accessed from inside their function scope. 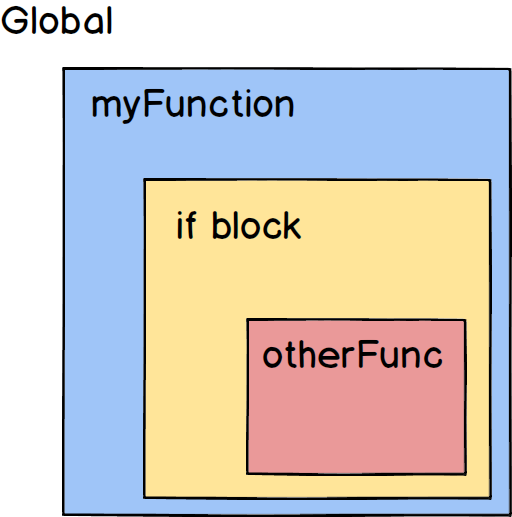 As the call stack builds up, each function has its own execution context. Variables declared in the global scope are added as properties of the window (the global object). These properties will be around for as long as the window exists; this can cause inadvertent naming collisions. Tools like webpack can help us avoid this by creating scope for each file it bundles up. Take minute to look at the bundle.js file of your gametime project. To make use of variables declared inside function scope while OUTSIDE that scope, the value must be returned out of the function. It’s important to note that the variable name does not come with the returned value. Above, you can see that when we run the function makeNumber(), the variable number does not become visible to the global scope. However, when we run the function in the last console.log, the function evaluates to 5. If we want to use values created by functions, we must return those values out of the function. Additionally, if that value needs to be used elsewhere in our code, we must capture it somehow. const number = makeNumber(); could be one way; assigning the returned value of the function to a new variable allows us to “store” or “capture” the value to be used elsewhere. console.log(firstNumber);  // why can't we access firstNumber? In the above example, the console log inside makeArray fails because parent scopes do not have access to variables declared in child scopes. However, the child has access to the variables declared in the parent scope (array). If we think about the house analogy, everyone in the house has access to common areas, but (and, yes, this house is highly unusual and trusting) no one has access to anything inside individuals’ rooms besides the owner of the room. variables declared with the keyword let or const are block scoped. This means that they are scoped to the block statement (if, for…) in which they are declared. The above code is broken. Why? How can we make it work? What will log? How does this change if we change variable declaration to use var instead of let? Why? Closures are expressions (usually functions) which can work with variables set within a certain context. In other words, a closure is an inner function that has access to the outer (enclosing) function’s variables’ scope chain. What’s happening in the code above? We’re declaring a variable counter, which is pointing to a function that is being called immediately (we’ll talk more about this in a minute). Inside the anonymous function, we’re declaring a variable count, whose value is 0. We’re returning an object with two keys, add and getCount, whose values are functions that increment the count variable and return it, respectively. This means that the value of counter is an object. The only way to access the count variable is by running one of our two methods, add or getCount. What’s the point of doing something like this? You’ll notice that there’s no way to mutate or overwrite the count variable, because it is completely protected within the closure. It’s only accessible through the functions provided by the closure itself. Take a look at the code above. Neither the function-scoped variable functionScopedVariable, nor the named function myScope are available in the global scope. Why is this? What do you notice about the syntax of this code? We can make use of IIFEs to create modules. Looking at this code, what do you think is happening? Functions are hoisted to the top of their scope. The above code will work, because the function is hoisted so it is declared and defined at the top of the code, above the function invocation. Why is that console log in setAge undefined, rather than 29 or even 32065? This is true regardless of what variable declaration keyword is used (var, let, or const all behave this way). The variable declaration is hoisted to the top of the scope, but the definition does not happen until where it is originally declared/defined. console.log(number);	// 1 - what will log here? console.log(number);		// 2 - what will log here? console.log(number);		// 3 - what will log here? console.log(number);  // what will log here? printGreeting("Danger");	// what will log here? printGreeting();			// what will log here? array()	// what will log here?